Help the Hostel Cookers Community! 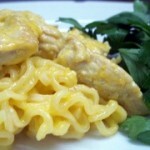 Currently viewing the tag: "ramen noddles"
Extremely easy and creamy chicken with hollandaise sauce! Another great recipe with ramen noodles! You can substitute regular noodles for the ramen noodles if you desire, you will just need to spice the dish yourself. Here you will find easy to prepare recipes for travelers. We have been backpacking on and off for almost five years gathering recipes in hostel kitchens wherever we go. We've included all of our favorite hostel recipes. We try to use only a couple ingredients and to keep everything healthy. Vegetables can be few and far between when traveling. If you have a recipe to add, please do! Thanks for stopping by! Feel free to join the community by adding a recipe or leaving comments! Stay updated by subscribing to the RSS feed.